December was rather hectic with business trips to Tokyo and Taiwan but the new year was more relaxed. Today we went out to join the crowds in Nara for Hatsumōde, the custom of visiting a shrine at new year. Around the largest shrine, Kasuga-taisha was very busy as expected, but the other temples nearby were not nearly so busy. 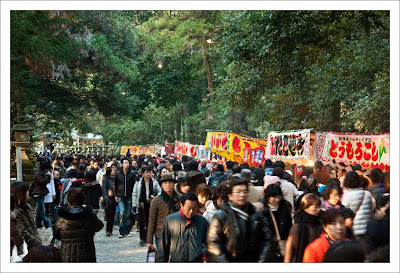 Along the path are many stalls or yatai selling food and snacks. At the shrine people often get a slip of paper on with their fortune on it. 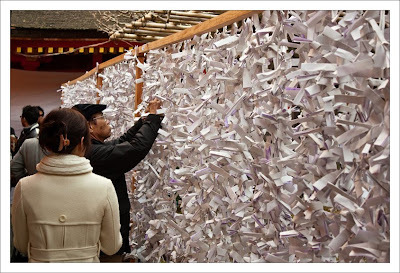 If it is bad it is tied to a tree or other structure at the shrine so that the bad luck can be left behind. 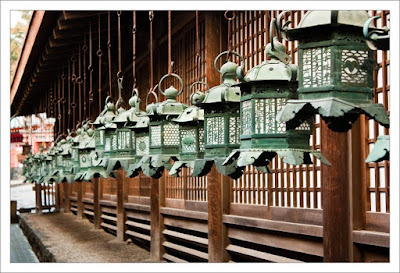 Kasuga is apparently famous for its bronze lanterns. This row of hanging lanterns caught my eye as we were leaving. 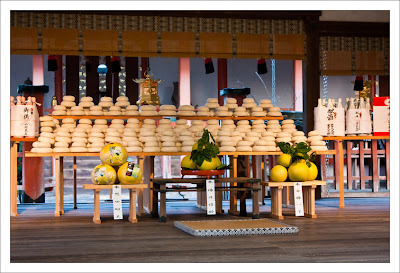 The temples are also decorated for the new year, The round white things on the table are mochi or rice cakes which are a traditional food at new year. 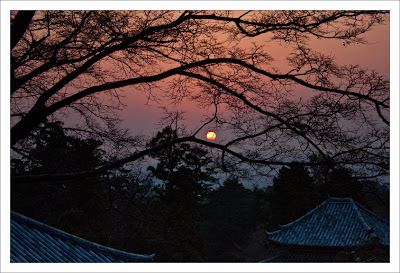 By the time we got to Nigatsu-d ō the sun was starting to set. It was a bit too hazy for a good sunset shot but the light behind the trees produced a nice silhouette.